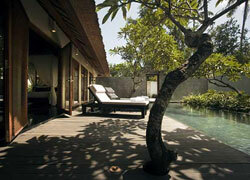 Bali Spa The spa is located in Nusa Dua Resort area. Spend the special healing time for yourself at Kayumanis Spa Nusa Dua, where you can stay away from noisy cities. There are Beach Club, etc. and you can use free pool also. Kayumanis’s menus with special discount prices requires a payment made via our Japanese bank deposit transfer in 7 days advance before your departure. 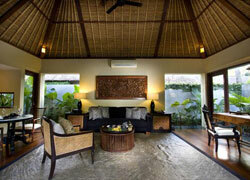 This is the package for 2 persons including 2 hours treatment and dinner (or lunch) in the luxury spa villa. Enjoy the afternoon tea at Beach Club or the restaurant before the treatment. 2 hours Treatment "Rilaxing Ritual"
1.Applr、Mint and coriander salad with Orange, Chili, Lime Dressing. This masculine ritual encourages men to take some quality time out for self indulgence away from the pressures of the business world. All traces of executive stress quickly fade away with an energy massage to restore vitality and drive. A reviving facial restores youthful looks, while a pedicure attends to one of the most neglected areas of the male anatomy. This pampering ritual for ladies takes a feminine approach towards health and beauty by eliminating cellulite with a mineral clay body scrub. Phase weo of the treatment is a 20minute volcanic mud body mask to draw out any impurities. Ii is followed by a choice of Relaxing or Energy Massage therapies for a calming effect on the body and mind. This head to toe indulgence concludes with a choice of Kayumanis Facial to enrich the skin. This is is Kayumanis special treatment to relax the tension of the whole body with warm oil. Experience the pleasure of overall indulgence with a nurturing treatment that pays attention to every part of the body. The ritual involves a therapeutic massage to optimize energy levels, while a body scrub will revive tires skin and stimulate circulation. A long soak in a bath ritual of your choice will excite the senses. An enllvening treatment created to balance the body, mind and spirit. Feel your stress and tension melt away under the deep heat of natural volcanic stones appllied to strategic energy points of the body. 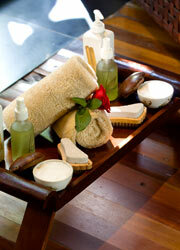 This is followed by a nourishing Kayumanis Facial of your choice. An enlivening treatment created to balance the body, mind and spirit. Feel your stress and tension melt way under the deep heat of natural volcanic stones applied to strategic energy points of the body. This is followed by a nourishing Kayumanis Facial of your choice. This massage is inspired by traditional Balinese massage. The long stroke massage improve for blood circulation and release from nervous and pressure. This firm and deep stroke massage treatment is performed using elbow pressure to restore depleted energy levels and release emotinal tension. the sheer strength of this exclusive therapy helps relieve stress as well as muscular aches and pains. The healing properties of heated natural volcanic stones help to relax tight muscles and purge negative energy. This treatment has s soothing effect on emotions that result in feeling of renewal. They use a technique of mirror movements to deliver a balance of strokes, hand pressure and improve blood circulation in your body while the ultimate body experience and relaxing treatment by 2 therapists. This traditional treatment uses the cotton with various herbs to warm up muscles and cure pain and inflammation. At the end, it leads you to the great relaxation. An exfoliating body treatment using a combination of natural products such as sea salt and herbs to remove dead skin cells, stimulate blood circulation and nourish delicate skin. Please choose one of the following products. This reviving treatment focuses on the use of pure and natural ingredients known for their nourishing properties such as lemon,honey and fresh cucumber. A candle nut peel will eliminate impurities, while ripe avocado flesh penetrates the skin for a deep moisturizing effect. This traditional facial combines fresh from of the garden ingredients with seaweed and anti-aging products manufactured by Martha Tillar, a company that celebrate Indonesia's natural healing and beauty heritage. Free transportation service for Jimbaran, Nusa Dua area. Children under 16 are not allowed to go inside of the spa. Need bank transfer payment 7 days prior of your departure. The spa is located near the beach, on the way back I went to the beach to see the sunset. The sunset I saw in Bali was special. I was happy to see it with him. 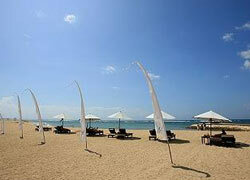 In the resort area of Nusa Dua!! It`s quiet, a nice place. I was attracted by anti aging menu (LOL) I am around thirty years old, so it is the turning point of the skin. Mud mask and seaweed paste facial made my skin fresh! In Bali UV is strong, so skin aftercare is also recommended.